Receptor tyrosine kinases are ectopically expressed in many cancers and have been identified as therapeutic targets in acute leukemia. This manuscript describes an efficient strategy for pre-clinical evaluation of tyrosine kinase inhibitors for the treatment of acute leukemia. Christoph, S., Lee-Sherick, A. B., Sather, S., DeRyckere, D., Graham, D. K. Pre-clinical Evaluation of Tyrosine Kinase Inhibitors for Treatment of Acute Leukemia. J. Vis. Exp. (79), e50720, doi:10.3791/50720 (2013). Receptor tyrosine kinases have been implicated in the development and progression of many cancers, including both leukemia and solid tumors, and are attractive druggable therapeutic targets. Here we describe an efficient four-step strategy for pre-clinical evaluation of tyrosine kinase inhibitors (TKIs) in the treatment of acute leukemia. Initially, western blot analysis is used to confirm target inhibition in cultured leukemia cells. Functional activity is then evaluated using clonogenic assays in methylcellulose or soft agar cultures. Experimental compounds that demonstrate activity in cell culture assays are evaluated in vivo using NOD-SCID-gamma (NSG) mice transplanted orthotopically with human leukemia cell lines. Initial in vivo pharmacodynamic studies evaluate target inhibition in leukemic blasts isolated from the bone marrow. This approach is used to determine the dose and schedule of administration required for effective target inhibition. Subsequent studies evaluate the efficacy of the TKIs in vivo using luciferase expressing leukemia cells, thereby allowing for non-invasive bioluminescent monitoring of leukemia burden and assessment of therapeutic response using an in vivo bioluminescence imaging system. This strategy has been effective for evaluation of TKIs in vitro and in vivo and can be applied for identification of molecularly-targeted agents with therapeutic potential or for direct comparison and prioritization of multiple compounds. Acute lymphoblastic leukemia (ALL) is the most common malignancy in children1,2. The overall survival rate for pediatric B-lineage ALL (B-ALL) is approximately 85%, but specific biological subtypes, including T-lineage ALL (T-ALL), have still poorer prognosis even with current therapeutic protocols. Further treatment of relapsed ALL remains a challenge3. Although the majority of adult patients with acute leukemia achieve a remission with up-front chemotherapy, many patients still suffer relapse4. Current chemotherapeutic regimens in the treatment of acute leukemia are known to cause toxicity-associated short- and long-term side effects. Therefore, less toxic therapies that specifically target cancer cells with minimal effect on normal tissues are greatly needed. In recent years, emphasis has been placed on the development of novel, molecularly-targeted agents with specificity for cancer cells, often utilizing iterative chemistry to generate multiple active compounds which must then be compared and prioritized5. This manuscript describes an efficient strategy for pre-clinical evaluation of TKIs for the treatment of acute leukemia, which can be used for evaluation of a single compound or for direct comparison of multiple compounds in order to facilitate drug development. The method presented here consists of four steps. First the biochemical (1) and anti-leukemia (2) activities of the compound(s) are evaluated in cell culture, then inhibition of the target is confirmed in animal models (3), and finally therapeutic efficacy of the TKI(s) is determined in orthotopic leukemia xenograft models (4). For these studies, it is important to choose relevant cell lines, which are representatives of the most common biologic subtypes. Cell lines should be selected, which both, express the target of interest and lack the target of interest, to investigate whether biologic effects are mediated by inhibition of the target. This is particularly relevant for the development of small molecule inhibitors, which have off-target effects that may be important for anti-tumor activity. It is also necessary to choose a cell line that is dependent on the target for functional effects such as proliferation or survival. Preliminary target validation studies (outside the scope of this article) using RNA interference or other specific means to inhibit the target can be used to identify target-dependent cell lines. It is also desirable to choose cell lines that can form murine xenografts, such that cell culture results can be more directly translated to in vivo experiments. For evaluation of biochemical activity mediated by TKIs in leukemia cells, a decrease in receptor phosphorylation can be used as an indicator of target inhibition. Western blot analysis or ELISA assays can be employed, depending on the availability and specificity of antibodies. If antibodies with sufficient specificity for the target are available, ELISA assays are preferable as they are more quantitative and efficient. In cases where antibodies with sufficient specificity for ELISA are not available, western blot analysis may be necessary. In this case, immunoprecipitation of a large amount of lysate can be useful for detection of targets that are in low abundance. This approach is particularly relevant for measurement of phospho-proteins, which may have a short half-life to allow for rapid changes in signaling in response to environmental stimuli. Some phosphorylated proteins are extremely labile, most likely as a result of complex formation with phosphatases. For robust and consistent detection of these phosphorylated proteins, it may also be possible to treat cells with pervanadate, an irreversible protein-tyrosine phosphatase inhibitor6, to stabilize the phospho-protein prior to preparation of whole cell lysates. To determine whether biochemical activity results in anti-tumor effects, target-dependent biological processes can be monitored in cell-based experiments. For leukemia cell lines, anti-leukemia activity mediated by TKIs can be assessed using colony formation assays performed in methylcellulose or soft agar7. Soft agar may be preferred as this is a solid medium that is more amenable to manipulation if repeated treatment with a TKI is necessary. While many acute myloid leukemia (AML) cell lines will form colonies in soft agar, most ALL cell lines will only form colonies in methylcellulose, which is a semi-solid medium. Although it is possible to refresh medium and/or TKIs in methylcellulose cultures, only small volumes can be used and with limited frequency. Similarly, it is more difficult to stain colonies without disrupting them in methylcellulose. Preliminary studies should define the ability of appropriate cell lines to form colonies in methylcellulose and/or soft agar and the optimal density of cells in culture such that colonies are non-overlapping and in sufficient number to obtain statistically relevant data (usually 50-200 colonies per 35 mm plate). While in vitro assays are robust and cost-effective, and have fewer ethical implications than whole animal experiments, advancement of therapeutic compounds requires proof of efficacy and safety in animal models. For in vivo studies, human acute leukemia cell lines can be orthotopically transplanted into NOD.Cg-Prkdcscid Il2rgtm1Wjl/SzJ (NSG) mice and TKIs can be easily administered by injection or oral gavage. Some cell lines may require exposure of NSG mice to a low cell line-dependent dose of radiation in order for xenografts to establish, and in this instance mice may not tolerate oral gavage without a 5-10 day recovery period post-irradiation. This manuscript describes generation of B-ALL and T-ALL xenografts using specific cell lines (697 and Jurkat) as examples but xenografts may be established in NSG mice using a wide variety of cell lines. In the event that other cell lines are more applicable, the requirement for irradiation, optimal number of cells to transplant, and timing of disease onset and progression should be determined experimentally. Ideally, these models will have complete penetrance (every animal transplanted develops leukemia), consistent kinetics (leukemia progresses similarly in all animals), and a reasonable treatment window (ideally 20-30 days between initiation of treatment and removal from study due to disease). The number of cells transplanted can be increased to improve penetrance and kinetic consistency or decreased to improve the treatment window if necessary. To determine if TKIs mediate target inhibition in vivo, samples are collected from mice with leukemia xenografts after treatment with TKI or vehicle only. Ideally, the dose and schedule of administration for these experiments are guided by pharmacokinetic studies, which can often be performed by commercial laboratories and are outside the scope of this article. If pharmacokinetic data are available, the concentration of compound required for effective target inhibition in cell culture and the maximum serum concentration following a single dose of TKI can be used to define a starting dose for animal studies. Pharmacokinetic studies can also inform the timing of sample collection post-treatment for pharmacodynamic studies and the route of administration. Inhibition of the target can be assessed in any affected organ but tissues that are most easily collected and processed are preferable. Most acute leukemia cell lines establish in the liver, bone marrow, spleen, peripheral blood, and the central nervous system, although the specific organs affected and the extent of engraftment in these organs varies between models. The protocol presented here assesses phospho-protein inhibition in bone marrow using western blot analysis, but solid organs may be easier to consistently harvest and require minimal or no processing prior to freezing, allowing less opportunity for degradation of phospho-proteins during sample collection and processing. Immunohistochemistry can also be used to evaluate solid tumors or organs affected by leukemia. Finally, the therapeutic efficacy of the TKI(s) is determined in orthotopic leukemia xenograft models. For these studies, the timing of treatment initiation can be varied, such that disease is more or less established. Treatment may begin immediately after transplant for initial studies and then be delayed in subsequent studies until significant disease burden is detected to more closely approximate a diagnostic treatment model. Ideally, these animal models also have the capacity for non-invasive measurement of disease burden. We have optimized methods for introduction of the firefly luciferase gene into leukemia cell lines using virus-like particles, allowing for non-invasive, longitudinal analysis of disease onset and progression and assessment of disease burden in bone marrow and solid organs. Critical to this approach is the use of monoclonal luciferase-tagged cell lines to prevent variability in development of luciferase-expressing leukemia associated with the use of polyclonal cell lines and is unrelated to treatment with a TKI8. Taken together, these steps can be used for evaluation of a single TKI or for direct comparison and ranking of multiple TKIs. While the protocols presented here focus on development of TKIs, these methods can be adapted to other targets and considerations for assay development are described. Thus, this strategy may be more broadly applicable to the pre-clinical evaluation of molecularly-targeted agents for treatment of acute leukemia. All experiments involving animals followed the regulatory standards approved by the University of Colorado Institutional Animal Care and Use Committee. The demonstrated protocol was approved by the University of Colorado Institutional Animal Care and Use Committee. Culture cell lines expressing the receptor tyrosine kinase of interest. Harvest cells and plate 3-5 x 106 cells/sample in 400 μl growth medium in a 48-well tissue culture dish. Incubate at 37 °C in 5% CO2 for 2-3 hr. Add 100 μl of 5x TKI solution in growth medium and incubate for 60 min. Prepare lysis buffer with 50 mM HEPES (pH 7.5), 150 mM NaCl, 10 mM EDTA, 10% (v/v) glycerol, 1% (v/v) Triton X-100, and protease inhibitors. If cultures will not be treated with pervanadate prior to harvest, add phosphatase inhibitors (1 mM sodium orthovanadate and 0.1 mM sodium molybdate) to lysis buffer. Prepare pervanadate (PV) phosphatase inhibitor solution immediately before use. Prepare a 0.3% solution of hydrogen peroxide (CAUTION) in cold phosphate-buffered saline (PBS) in a dark tube on ice (1:100 dilution of a 30% stock solution). Boil an aliquot of 0.2 M sodium orthovanadate (OV, CAUTION) stock solution for 5 min. Dilute 1:10 in PBS to make 20 mM OV solution at room temperature (RT). Mix 0.3% hydrogen peroxide and 20 mM OV 1:1 and incubate in the dark at RT for 20 min. Dilute PV into complete medium (60 μl PV + 940 μl medium). Add 100 μl of diluted PV/well. Incubate at 37 °C in 5% CO2 for 3 min and then place plate on ice. Harvest the cells in cold microfuge tubes at 2,500 rpm for 5 min. Aspirate supernatant and resuspend cells in 120 μl of lysis buffer. Incubate on ice for 15 min. Clarify the lysate in a cold microfuge at 6,000 rpm for 3 min. Transfer supernatant to a fresh cold tube. Store at -80 °C. Spin down Protein G sepharose beads in microfuge at 1,000 rpm for 1 min. Remove supernatant and wash beads 2x with 1 ml cold PBS. Add an equal volume of PBS to make a 50% slurry. Add primary antibody and 20 μl 50% Protein G beads to each sample. Incubate for 2 hr - O/N at 4 °C on a rotator. Pulse down beads in a cold microfuge at 9,000 rpm. Remove supernatant and wash beads 2x with 150 μl cold lysis buffer. Spin in cold microfuge at 1,000 rpm for 1 min. Remove supernatant and resuspend pellet in 20 μl 2X SDS Sample Buffer with 2-mercaptoethanol (CAUTION). Use immediately or store at -80 °C. Boil samples for 5 min and run on an SDS-PAGE tris-glycine gel. Transfer the proteins to a nitrocellulose membrane and detect phospho-protein by western blot. Rinse blot with water and then incubate in 2% SDS, 62.5 mM Tris (pH 6.8), 0.1 M β-mercaptoethanol (CAUTION) for 30 min at 50 °C. Rinse 2x with water and then wash for 60-90 min in 5-6 changes of TBS-T to remove stripping solution. Detect total-protein by western blot. Add 500 μl of 10x TKI or vehicle in growth medium to 4 ml of methylcellulose and vortex mixture for 10 sec. Harvest and count cells. Prepare a cell suspension in growth medium in a concentration, which is 10x higher than the final cell concentration. Add 500 μl cell suspension to methylcellulose mixture. Vortex for 10 sec and let sit for 10 min to remove bubbles. Draw up 4 ml of methylcellulose mixture using a 5 ml syringe and sterile large bore blunt end needle. Avoid drawing up bubbles. Dispense 1 ml of the methylcellulose mixture into the center of three 35 mm tissue culture plates. Swirl the dishes until the bottom is completely covered with methylcellulose. For each methylcellulose plate, prepare a 10 cm sterile tissue culture plate with two additional 35 mm tissue culture plates filled with sterile water to ensure a humid environment. Place cultures in water jacketed incubator at 37 °C in 5% CO2 for 10-14 days. Count colonies after 1-2 weeks. Colonies should be more than 20 cells and not overlapping. Colonies can be counted using an inverted microscope equipped with a microscope stage with a grid or using an automated colony counter. Changes in colony size or morphology in response to treatment with TKI should also be evaluated. To improve detection by colony counter, stain colonies by adding 60-100 μl of (3-(4,5-Dimethyl-2-thiazolyl)-2,5-diphenyl-2H-tetrazolium bromide solution (MTT, 5 mg/ml in H2O, store at -20 °C, protect from light, CAUTION) drop-wise over the surface of each plate and incubating for 8 hr at 37 °C in 5% CO2. Prepare 1% noble agar for bottom layer, 0.7% noble agar for top layer and 2x growth medium. Equilibrate 2x growth medium in a 42 °C water bath. Heat 1% and 0.7% noble agar in a microwave (approximately 1 min/100 ml) and equilibrate in a 42 °C water bath. Mix equal parts of 1% agar and 2x medium and separately 0.7% agar and 2x medium in 50 ml conicals. Plan 10 ml of soft agar mixture/six-well plate for each layer. Label 6-well tissue culture plates. Fill each well with 1.5 ml 1% soft agar mixture. Avoid bubbles during plating. Dry plates with lids off in sterile hood for 30 min. Count cells. Prepare a cell suspension in growth medium in a concentration, which is 500x higher than the final cell concentration. Add cell suspension to 0.7% agar mixture, mix well and dispense 1.5 ml of the agar cell mixture on the top of the 1% agar layer. Let the top layer solidify for 30 min. Prepare 1x growth medium containing TKI or vehicle control. Add 2 ml of medium with desired concentration of TKI on top of the top agar layer. Incubate cultures for 10 days at 37 °C in 5% CO2. Remove and replace the overlaying medium every 3 days. When colonies are visible to the naked eye, aspirate overlaying medium and add 200 μl nitro-tetrazolium blue solution (1 mg/ml NBT in H2O, store at 4 °C, protect from light, CAUTION). Return to incubator for 24-48 hr. Move to 4 °C for at least 2 hr prior to counting. 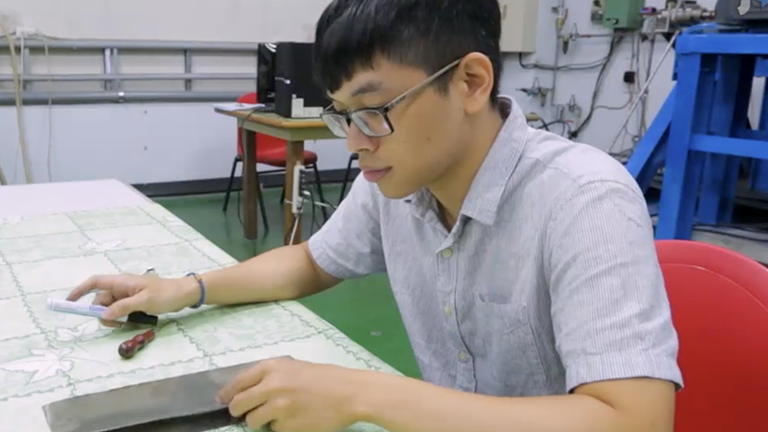 Stained plates can be stored at 4 °C for one month. Count colonies using a microscope or an automated colony counter. Collect cells growing in log phase by centrifugation in a table top centrifuge at 1,500 rpm for 5 min. Wash the cells once with sterile PBS and resuspend in PBS at an appropriate concentration (typically 1-5 x 107 cells/ml). Transplant cells in a volume of 100 μl into 6-12 week old NSG mice by intravenous injection into the tail vein using a 28 G insulin syringe. Place the animal in a restrainer, heat the tail in a beaker of warm water to dilate the veins, and clean the tail with a chlorhexidine swab prior to injection. After injection, apply pressure to the injection site using sterile gauze until bleeding stops. Transplant at least 3 animals/group. Maintain the mice on water containing 1 mg/ml gentamycin sulfate. Fourteen days post-transplant, treat animals with TKI or vehicle only and harvest samples for analysis of target inhibition. Weigh animals and treat with an appropriate dose (mg/kg of body weight) of TKI or vehicle. Administer treatment in a volume of 5 ml/kg body weight by intraperitoneal (i.p.) injection or 10 ml/kg body weight by oral gavage. For i.p. injection, restrain the mouse manually and inject in the lower right quadrant of the abdomen using a 29 G needle. For oral gavage, restrain the mouse manually and hold the animal upright. Place the gavage tube in the mouth over the tongue and into the back of the mouth. Apply slight pressure to pass the tube through the esophagus and into the stomach. Depress the syringe plunger to administer treatment. If the plunger does not depress easily the gavage needle should be removed and repositioned. Prepare TKI formulations immediately before use. If pervanadate treatment is desired, prepare PV solution 20 min before harvest as described above (step 1.1.4) and dilute into medium with 1 μM MgCl2 and 100 U/ml DNase (120 μl PV + 880 μl medium). Note: PV is stable for at least 1 hr after dilution. Sacrifice animals by CO2 narcosis at the appropriate time(s) post-treatment. Dissect femurs by removing fur, skin and muscle from the entire leg so that the bones are completely exposed. Remove the femurs by clipping with dissecting scissors just below the hip joint and again above the knee joint. Transfer to a Petri dish and flush bone marrow with 1 ml cold PBS or diluted PV solution using a syringe and a 27 G needle. If treating with PV, incubate at RT in the dark for 10 min. Prepare lysates and analyze phospho-protein and total-protein levels as indicated above (steps 1.1.6-1.2.5). Quantitate relative phospho-protein and total-protein levels for each sample using densitometry. Calculate phospho-protein/total-protein relative to the average phospho-protein/total-protein value for vehicle-treated animals. If necessary, expose mice to 200 cGy of radiation in a RS-2000 irradiator one day prior to transplant. Transplant mice with leukemia cell lines as described above (step 4.1). Transplant at least 6 mice per group. Identify mice by ear punch. Alternatively, a black marker may be used to identify mice with hash marks on their tails. Add enrichment to cages to reduce the potential for cage mate aggression during the study. Treat mice with a TKI or vehicle only as described above (step 4.2). Monitor the health status of mice daily via physical examination and weight determination. Expected symptoms of leukemia (reduced activity level, weight loss, hind limb paralysis, and eye infections). Weight loss more than 10%-15% is usually associated with the death of the mouse within two days and is typically a surrogate endpoint for death in accordance with standard IACUC requirements. Monitor engraftment and development of leukemia via an in vivo bioluminescence imaging system up to 2x weekly. Prepare a 200x D-luciferin stock solution (30 mg/ml) in sterile water. Mix gently by inversion until D-luciferin is completely dissolved. Use immediately, or aliquot and freeze at -20 °C. Prior to imaging using an in vivo bioluminescence imaging system, thaw aliquots of D-luciferin at RT and dilute 1:2 in PBS to a final concentration of 15 mg/ml and filter sterilize through a 0.2 μm filter. Anesthetize the mice before imaging with 1.5% inhaled isoflurane in oxygen. Monitor sufficient anesthesia, characterized by muscle relaxation, loss of movement, and loss of response to toe-pinch stimulation. Immediately before imaging, administer 150 mg/kg body weight D-luciferin by i.p. injection (10 μl of 15 mg/ml luciferin/g of body weight). Use an in vivo bioluminescence imaging system to capture 2 series of images with sequential 30, 60 and 90 sec exposures and a final image with a 120 sec exposure. After imaging, return mice to cages and monitor for recovery from anesthesia. Depending on the intensity of bioluminescence, exposure times can be varied. Optimal exposure times should be predetermined for a given model and kept consistent such that the signal intensities for individual time points are comparable across the entire study. Determine bioluminescence intensity for each mouse using Living Image 3.2 acquisition and analysis software. Determine total flux values measured in photons/second by drawing regions of interest (ROI) of identical size over each mouse. Sacrifice mice by CO2 exposure and cervical dislocation if moribund, exhibiting paralysis, in the event of greater than 15% weight loss, or at the end of the study. Dissect mice and record observations (e.g. enlargement of spleen, liver, or lymph nodes; pale bone marrow). Dissect femurs and flush bone marrow with cold PBS using a 27 G needle. Collect cells in a microfuge at 2,500 rpm for 5 min. Resuspend cells in PBS containing 2% FBS and incubate for 5 min at RT. Collect cells and stain with 20 mg/ml DAPI (4,6-Diamidino-2-phenylindole dihydrochloride, 1:1,000) and FITC-conjugated α-hCD45 (1:100) or mouse IgG1 isotype control antibody (1:100). Evaluate leukemia engraftment using flow cytometry. Gate on the viable population (DAPI negative) and determine percentage of CD45+ cells (% bone marrow blasts). The assays presented here evaluate the biochemical and functional effects mediated by TKIs and can be used to rank novel compounds based on the degree of target inhibition in vitro and in vivo, reduction of colony formation, and delay in leukemogenesis in NSG mice transplanted with luciferase-tagged leukemia cells. Immunoblot analysis was utilized to determine inhibition of the active phosphorylated form of the target protein in leukemia cells following treatment with TKIs. Treatment with TKIs resulted in a dose-dependent decrease in the amount of phosphorylated protein. Figure 1 shows inhibition of target phosphorylation by three different TKIs in an acute leukemia cell line with TKI C being the most potent, TKI B being less potent, and TKI A having no effect. Thus, this assay allows ranking of compounds based on potency of biochemical activity in a cell-based model system. In the examples shown in Figure 1, enrichment of the antigen by immunoprecipitation and the use of the phosphatase inhibitor pervanadate were necessary to achieve interpretable results. Reason for that might be, that the protein phosphorylation of this tyrosine kinase is extreme labile. To study the effect of TKIs on oncogenic properties of acute leukemia cells, colony formation assays were used. We investigated the ability of target-dependent leukemia cells to form colonies in methylcellulose-based (ALL) medium and in soft agar (AML). In the example shown in Figure 2A, a statistically significant reduction in colony number was observed in an ALL cell line after treatment with a TKI. Similar results were observed in AML cell lines after treatment with TKIs in soft agar. In Figure 2B, there is a trend toward decreased colony number in response to treatment with TKI and the decrease appears dose-dependent, but the difference is not statistically significant as result of variability between replicates. Note the large standard errors in Figure 2B relative to Figure 2A. Ample mixing of the cells into the semi-solid medium and equal distribution of the semi-solid medium into the wells or plates is critical for consistency between replicates in clonogenic assays. Accurate counting of viable cells prior to plating is also important to ensure consistency between experiments. Figure 2C shows a plate with an uneven distribution of colonies, bubbles in the soft agar, and incomplete spreading of the soft agar in the plate (right panel) and a plate with adequate plating for comparison (left panel). To ensure that the methylcellulose does not dry out during the incubation period it is also important to include plates of sterile water in each dish. Dehydration of the methylcellulose medium changes its density and thereby reduces the ability of cells to form colonies, potentially preventing generation of useful results. To determine whether TKIs can inhibit the target protein in vivo, western blot analysis was employed to examine phospho-protein and total-protein levels in bone marrow blasts isolated from NSG mice transplanted with an acute leukemia cell line. In the example shown in Figure 3, pharmacodynamic analysis revealed a decrease in phospho-protein levels in leukemic blasts isolated from mice treated with TKI relative to mice treated with vehicle only. These studies demonstrate inhibition of auto-phosphorylation in leukemia cells following treatment with TKIs in vivo, confirming that these compounds reach the bone marrow and effectively inhibit the target. TKI D was less active than TKI E in this assay. The example shown, required utilization of pervanadate to stabilize the target phospho-protein and allow for detection. An orthotopic mouse xenograft model of acute leukemia in NSG mice injected with a luciferase-expressing ALL cell line was used to assess the effect of treatment with a TKI on oncogenic potential in vivo. As shown in Figure 4, mice treated with TKI had a significant lower level of bioluminescence, indicating a reduced leukemia burden relative to mice treated with vehicle only. After 10 days of treatment, all mice had a low level of bioluminescence that was not significantly different between animals treated with vehicle and animals treated with TKI. 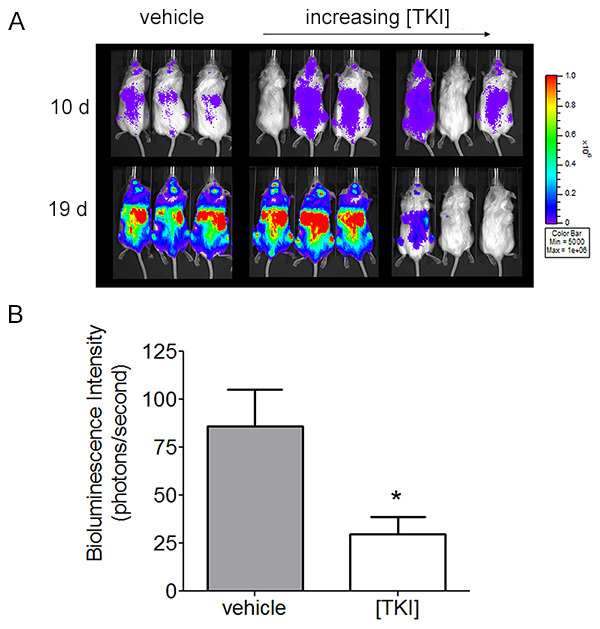 In contrast, by 19 days post-treatment, vehicle-treated mice had significant higher bioluminescence intensity (86.12±19.17 photons/sec), while mice treated with a high dose of TKI had much lower signal intensity (29.64±9.04 photons/sec). Figure 1. TKIs inhibit phosphorylation of the target protein in vitro. Cell cultures were treated with the indicated concentrations of TKI A, TKI B, or TKI C for 1 hr. Pervanadate was added to cell cultures for 3 min to stabilize the phosphorylated form of the target protein. The target protein was immunoprecipitated from cell lysates and phospho-protein and total-protein were detected by western blot. Click here to view larger image. Figure 2. TKI reduces colony formation in acute leukemia cell lines in methylcellulose and soft agar. ALL cells were plated in methylcellulose (A) and AML cells were plated in soft agar (B) in the presence of a TKI or DMSO (vehicle control). Colonies were counted after 2 weeks in culture. Mean values and standard errors were derived from triplicate plates. (C) Representative soft agar plates with optimal distribution of colonies (left panel) or unequal distribution of colonies and a partly detached soft agar (right panel) are shown. Click here to view larger image. Figure 3. Treatment with TKI reduces phospho-protein levels in vivo. A NSG mice were transplanted with an ALL cell line and treated with a single dose of TKI D, TKI E, or vehicle only after development of leukemia. Bone marrow cells were collected from femurs and treated with pervanadate prior to preparation of whole cell lysates. Immunoprecipitation of target protein, and detection of phospho- and total-proteins by western blot were performed. B Signal intensity was quantitated by densitometry and the fraction of phosphorylated target protein relative to vehicle treated animals was calculated. Click here to view larger image. Figure 4. Treatment with TKI delays disease progression in mice transplanted with a luciferase-expressing human ALL cell line. NSG mice were transplanted with a monoclonal population of luciferase-transduced ALL cells by injection into the tail vein. D-luciferin was injected intraperitoneally and bioluminescence images were taken twice weekly (Bining: 8, FOV 19.6, f/stop 1, exposure time 120 sec). A Pseudocolor images are shown demonstrating increased bioluminescence intensity over time in mice transplanted with leukemia cells and a dose-dependent reduction in bioluminescence intensity in animals treated with a TKI. B Quantitation of mean bioluminescence intensity and standard error for each study group. Click here to view larger image. This manuscript describes an effective strategy for evaluation of novel tyrosine kinase inhibitors in the treatment of acute leukemia. Using this approach, biochemical and anti-leukemia activities are evaluated first in cell-based assays in vitro and then in xenograft models in vivo. Immunoblot analysis was successfully utilized to demonstrate inhibition of the target tyrosine kinase in leukemia cells after treatment with TKIs and to directly compare the potency of multiple compounds in cells. In the protocol presented here, pervanadate was used to stabilize the phospho-protein and the target protein was concentrated by immunoprecipitation. If these measurements were insufficient to allow for detection by western blot, the levels of phospho-protein could also be increased by the addition of ligand, either with or without pervanadate. Similarly, the ligand can be added to the solution used to flush the bone marrow for pharmacodynamic studies. Ligand can be purified or, in some cases, can be provided as a component of fetal bovine serum. In the event that these methods do not allow for detection of auto-phosphorylated tyrosine kinase, downstream targets can also be used for assessment of target inhibition, although it is preferable to assess activity of the target protein directly when possible. Of note, caution should be used when interpreting the results of experiments using pervanadate, which is a non-selective phosphatase inhibitor that affects many cellular proteins. For this reason, pervanadate should not be used for detection of changes in downstream signaling components. Prior to study in animal models, it is desirable to confirm anti-leukemia activity mediated by TKIs in leukemia cells. For these studies we rely on clonogenic assays in methylcellulose or soft agar medium. While other assays can also be used to evaluate anti-tumor effects in culture, colony formation assays are often more predictive of in vivo efficacy relative to more traditional assays that assess proliferation and/or survival in liquid culture. However, these assays may be used along with colony formation assays to evaluate the mechanisms of anti-leukemia activity mediated by TKIs and can also be useful in the event that a cell line of interest does not form colonies. Specifically, it may be useful to assess induction of apoptosis in response to treatment with TKIs using flow cytometric assays to determine levels of the cleaved/activated caspases, increased binding of Annexin V to the cell surface, or differential uptake of YOPRO-1-iodide. Similarly, decreased proliferation or induction of differentiation may also contribute to anti-leukemia activity. As such, growth curves can be generated in the presence and absence of TKI to assess proliferation and cellular morphology and changes in expression of cell surface markers can be examined to determine differentiation stage. The use of clonogenic assays is well established in the field of drug development and serves as a cost effective tool for evaluation of TKIs. However, it is known that systematic alterations in the culture conditions (including the addition of growth factors and other supplements, variations in serum composition, and differences in the pH of the TKI solution) can influence both colony growth and chemosensitivity9,10. Therefore, consistency in culture conditions is critical for reproducibility in this assay. Uneven distribution of cells or TKI can also lead to the mischaracterization of the efficacy of experimental therapies (Figure 2C). In addition evaluation of more than one time point for colony counting or plating after drug exposure may help to distinguish between drugs that mediate anti-proliferative effects but have no curative potential7. The in vivo studies described here represent a critical step on the path toward clinical application of a TKI. Pharmacodynamic studies to demonstrate target inhibition are important to define the relevant dose and frequency of administration for subsequent studies to evaluate efficacy. In most cases it is preferable to attain complete and continuous inhibition of the target protein and this may require treatment more than once a day. In addition, inhibition of leukemogenesis and increased survival in xenograft models may require a higher dose of TKI than is required for complete and continuous biochemical inhibition in the bone marrow. This may occur because leukemia establishes at multiple sites and exposure to TKIs may be heterogeneous in different anatomic locations, including the brain, or it could reflect limitations in the sensitivity of the assay resulting in a failure to detect limited remaining amounts of active target protein (i.e. incomplete target inhibition). Nonetheless, unlike traditional cytotoxic therapies which are administered at their maximum tolerated dose, the more tumor-selective molecularly-targeted agents may be equally effective at lower doses that are sufficient for biochemical inhibition of the target protein but are not associated with significant toxicities. Thus, for this class of agents, initial studies to evaluate the effects of a TKI on leukemia progression in xenograft models often utilize the minimal dose required to obtain complete and continuous inhibition of the target. If no effects on leukemia progression or survival are observed, the dose can be increased until toxicity is observed. These models can also be used to investigate the effects of a TKI administered in combination with standard leukemia therapies, thereby informing the development subsequent clinical protocols. The establishment of xenograft models of acute leukemia using luciferase-expressing cells represents a major advance over more traditional xenograft models and has the potential to considerably accelerate the process of drug discovery and development11. Bioluminescence imaging allows for non-invasive longitudinal determination of leukemia burden, thereby decreasing the number of animals needed for studies, and can also provide information about the anatomic location of disease. In addition, in an effort to expand upon potential clinical utilities of TKIs, bioluminescence imaging can be reproducibly achieved after transplantation of primary human luciferase-tagged patient samples12. However, interpretation of bioluminescence images can be challenging due to positional uncertainty of the light-emitting cells and thus in vivo bioluminescence imaging should only be used as a semiquantitative tool to follow the same animal under identical conditions13. In the fortunate event that multiple compounds have significant and comparable activity in the assays described here, additional criteria that may be used for further ranking of compounds include relative ease of compound synthesis, solubility, degree of oral bioavailability, pharmacokinetic properties, and toxicology studies. Taken together, these data should allow for identification of an optimal compound for progression to clinical investigation and are necessary to support filing of an Investigational New Drug (IND) application with the Food and Drug Administration (FDA) to enable clinical studies. After generating these critical pre-clinical data necessary for advancement of these novel agents into the clinic, utilization of the National Institute of Health's Cancer Therapy Evaluation Program (CTEP) should be considered. In this program clinical trials are sponsored to evaluate new anti-cancer agents, with a particular emphasis on translational research. Care should be taken to coordinate public presentation of pre-clinical data, including description of the structures and synthesis of novel compounds, with submission of patent applications to protect intellectual property rights. In general, data should not be publicly presented until patent applications protecting composition of matter and methods of use have been filed. In conclusion, we have demonstrated an efficient strategy to investigate and evaluate the potential of novel TKIs as therapeutic agents for treatment of acute leukemia. Target inhibition in leukemia cells, both in culture and isolated from the bone marrow of mice with human leukemia xenografts, can be assessed by immunoblot. The functional significance of target inhibition can be evaluated using clonogenic assays and orthotopic murine xenograft models with bioluminescent imaging. Together these assays provide critical pre-clinical data necessary for advancement of these novel translational agents into the clinic. In vivo imaging was performed using the IVIS Shared Resource at the University of Colorado Cancer Center (supported by grant P30-CA046934). Flow cytometry was performed at the Flow Cytometry Shared Resource, University of Colorado Cancer Center (supported by grant P30CA046934). This work was supported in part by the National Institutes of Health (RO1CA137078 to DKG). ABLS is a Fellow of the Pediatric Scientist Development Program, supported by grants from the American Academy of Pediatrics, the American Pediatric Society, and the Eunice Kennedy Shriver National Institute of Child Health and Human Development (K12-HD000850). Jemal, A., Siegel, R., Xu, J. Cancer Statistics. 2010. CA Cancer J. Clin. 60, 277-300 (2010). Kaatsch, P. Epidemiology of childhood cancer. Cancer Treat Rev. 36, 277-285 (2010). Pui, C., Mullighan, C., Evans, W., Relling, M. Pediatric acute lymphoblastic leukemia: where are we going and how do we get there? Blood. 120, 1165-1174 (2012). Forman, S., Rowe, J. M. The myth of the second remission of acute leukemia in the adult. Blood. 121, 1077-1082 (2013). Ohanian, M., Cortes, J., Kantarjian, H., Jabbour, E. Tyrosine kinase inhibitors in acute and chronic leukemias. Expert Opin Pharmacother. 13, 927-938 (2012). Mikalsen, S., Kaalhus, O. Properties of pervanadate and permolybdate. Connexin43, phosphatase inhibition, and thiol reactivity as model systems. J. Biol. Chem. 273, 10036-10045 (1998). Zips, D., Thames, H., Baumann, M. New anticancer agents: in vitro and in vivo evaluation. In Vivo. 19, 1-7 (2005). Christoph, S., et al. Bioluminescence imaging of leukemia cell lines in vitro and in mouse xenografts: Effects of monoclonal and polyclonal cell populations on intensity and kinetics of photon emission. J. Hematol. Oncol. 6, 10 (2013). Endresen, L., Tveit, K., Rugstad, H., Pihl, A. Chemosensitivity measurements of human tumour cells by soft agar assays are influenced by the culture conditions. Br. J. Cancer. 51, 843-852 (1985). Tveit, K., Endresen, L., Rugstad, H., Fodstad, O., Pihl, A. Comparison of two soft-agar methods for assaying chemosensitivity of human tumours in vitro: malignant melanomas. Br. J. Cancer. 44, 539-544 (1981). Rudin, M., Weissleder, R. Molecular imaging in drug discovery and development. Nat Rev Drug Discov. 2, 123-131 (2003). Barrett, D., et al. Noninvasive bioluminescent imaging of primary patient acute lymphoblastic leukemia: a strategy for preclinical modeling. Blood. 118, 112-117 (2011). Rice, B., Cable, M., Nelson, M. B. In vivo imaging of light-emitting probes. J. Biomed Opt. 6, 432-440 (2001).